From yesteryear hand painted canvases to the contemporary glossy backlit banners, Bollywood film posters have certainly come a long way. Now there is a book…dedicated solely to Bollywood posters over the decades. Chronicling this pictorial history of film posters are writers Jerry Pinto and Sheena Sippy with a book simply titled Bollywood Posters. So feast your eyes on this vibrant, sketchy journey from yesteryear posters of films we did not even know exist; to popular action, romance and drama titles, they all figure in this one. They've also positioned original and remakes against each other for the effect. Basically, it’s the writers way of sustaining and documenting some of those images that remain etched in public memory, but might get washed away due of passage of time. Pinto says, "Posters are part of our visual sensibility; for instance, that Don poster of Amitabh running. We know that poster; it's part of our aesthetic sensibilities." So from the technicolour designs of the 1950s to the contemporary aesthetic sensibilities, the 250 odd posters in this book speak a lot about the work that went behind procuring and restoring them. Sippy says, "The exercise was multifold, I worked on some original posters, some of them were brittle and needed a lot of work, some we got from the archives which thankfully were in slides form. The writers have their own favourites. While Pinto says he finds the Bobby poster psychedelic which spoke of the new youth cinema that had emerged from RK's banner, Sippy feels Utsav’s sensibility is beautiful." If you are a true blue Bollywood film buff, then perhaps you wouldn't want to miss getting this colourful book for your collection. The latest film-related coffee table book on offer from publishers India Book House stands out for two main reasons: the research entailed in compiling this collection of Bollywood posters and the wonderful production of the book itself. Author Jerry Pinto and visual consultant Sheena Sippy’s large format book serves primarily as a valuable archive of the history of Hindi films through the artistry of its posters and publicity material. 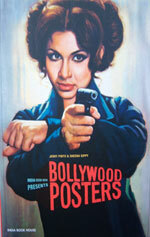 A tantalising image of Sharmila Tagore pointing a gun from the poster of Kewal Mishra’s Do Shatru enjoys pride of place on the cover. While the emphasis is on film poster images (225 colour illustrations), Pinto writes brief chapters tracing the history of Hindi cinema and explores various sub-texts and trends, aided by posters. The book is also peppered with single-page sections spotlighting sub-genres like comedy, horror and parallel cinema to illustrate how the poster art form, colours and structure took on a unique character. The layout interestingly juxtaposes posters of the old and new, as in the two versions of Don and the English and Hindi language posters of Kahin Aar Kahin Paar. Unfortunately, the most interesting and relevant chapter, ‘The art of the poster’, which touches upon the challenges of hand-painted posters, their demise and advent of computer- generated imagery plus mention of the most celebrated poster painter, MF Husain, comes at the end of the book. But then again, the book is not text-heavy and you are more likely to leaf through the book and scrutinise the imagery a few times before venturing into reading the chapters. Each time you flip through Bollywood Posters, you make new discoveries like the use of colours, typography, and the predominance of English text, brushstrokes and prominent credit given to the technicians. Some standout posters include Zehreela Insaan, for its use of pointillist style; Rocket Tarzan portraying a robot hero carrying a damsel in distress; Bobby’s ’70s free love and flower power artistry; and Kidar Kapoor’s Toofan with its priceless tagline: “A gay romantic swashbuckling entertainer”. Our reaction to the line and the image of the masked lead actor in a fencing pose is a reflection of changing times. The black-and-white posters of Shashi Kapoor’s Utsav, with a single multi-colour element, are truly artistic. Of contemporary films, the noir Manorama Six Feet Under and a poster of Rang De Basanti with black ink drawings and orange typeface stand out. Look out also for the image of A R Kardar’s Shahjehan (1946). Pinto describes the poster saying that it “takes it cues from what the designer assumed was the Mughal atelier, stylising the faces until there was no resemblance to the actors”. While the book laments the overriding influence of marketing and perfect representations today, it remains a reminder of the lost charm of hand-painted posters, the less-than-perfect rendition of the cast, and is a wonderful catalogue of the passion within Bollywood. Bollywood Posters is like walking through a film museum or art gallery — it is a sumptuous visual treat for cinema and art lovers.